President Rivlin visited the home of Bedouin boy killed by Egyptian fire, says no difference between Bedouin child and Jewish child. 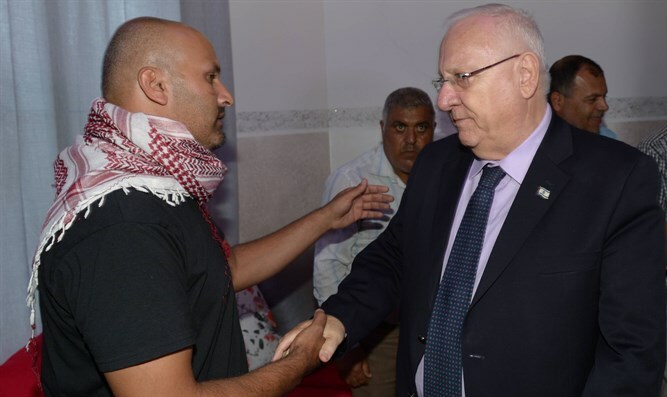 President Reuven Rivlin visited the home of Nimer Abu Amar, the 15-year-old youth from the Negev Bedouin town of Lakiya who was killed by fire from an Egyptian soldier at Israel's southern border Tuesday, to express his condolences to the boy's family. "We are all citizens of the same country." Rivlin told the boy's father. "We have come to share in your profound grief." "We are all equal in this country, and there is no difference between a child in Lakiya and a child in Tel Aviv, Jerusalem, or Haifa." he added. The Defense Ministry treats a child from Lakiya exactly the same way as it treats every other child, and we will do our utmost to investigate the circumstances which led to this tragedy." The boy's father, Bassam Abu-Amar, said "I expect the Defense Ministry to act justly in investigating the matter. Our pain is immeasurable. He was our first born son." The boy's uncle said "We will continue to work with the Defense Ministry. Generation after generation will work for the nation and at the border. We know that the Defense Ministry will investigate and learn the appropriate lessons. He is our child, he is your child and he is my child, and there is no argument about that." Rivlin the family members present and promised that the relevant officials at the president's office would continue to follow up on the investigation into this tragic incident.